These rabbits are involved in research aimed at preventing fluid build-up in the chest, which happens in humans and animals battling certain forms of cancer. These rabbits do not have cancer; but fluid build-up can be simulated in the animals, so that treatment strategies can be developed. Just like humans, the animals receive pain medication when necessary. 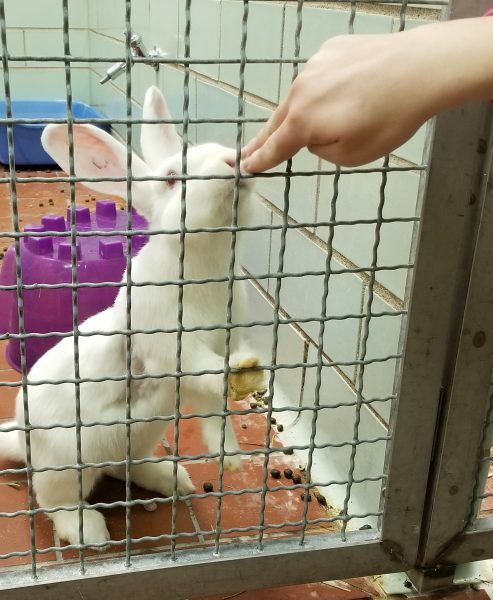 After treatment, the rabbits are trained to come to the front of the run by offering them a tasty treat, allowing researchers to observe their healing progress daily. This allows animal care experts to monitor the health of the rabbits, without creating unnecessary stress by going into the pen.